Take Ramen noodles to the next level with this mega simple recipe. The cabbage makes most of the salad while noodles and almonds provide a delicious crunch, followed by wine vinegar, sugar and soy sauce. This vegetarian friendly dish will curb your cravings for Asian food in the healthiest way. 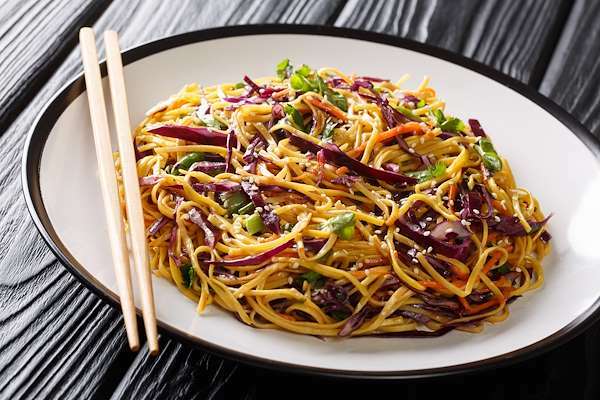 RecipeSavants.com Take Ramen noodles to the next level with this mega simple recipe. The cabbage makes most of the salad while noodles and almonds provide a delicious crunch, followed by wine vinegar, sugar and soy sauce. This vegetarian friendly dish will curb your cravings for Asian food in the healthiest way. Smart Recipes, Vegetarian Recipes, Vegetables,Other Recipes, Recipes Vegetables,Other Vegetarian Chinese Cabbage Salad PT30M Serves 10 Ingredients: 0.5 Cup Vegetable Oil 0.25 Cup Wine Vinegar 0.5 Cup White Sugar 1 Tablespoon Soy Sauce 1 Cup Sesame Seeds 0.5 Cup Silvered Almonds Whisk together vinegar, oil, soy sauce and sugar in a bowl until sugar dissolves. Refrigerate the dressing to keep it chilled until you prepare the salad. Preheat the oven to 350 degrees F. On a baking sheet, spread almonds, Raman noodles and sesame seeds. Bake Raman noodles for about 15 minutes or until lightly brown. Keep watching the noodles every now and then to avoid burning. Leave to cool for a while. Mix together scallions, cabbage and Ramen noodles in a salad bowl. Toss with dressing and serve.